NEW YORK (AP) — When the July 31 trade deadline came and went, Kevin Gausman switched uniforms while Zack Wheeler stayed put. The two starters squared off just a few days later, and it was Wheeler who looked completely at ease. Gausman was outpitched in his Braves debut as the New York Mets won 3-0 on Saturday night to stop Atlanta’s five-game winning streak. Facing his hometown team, Wheeler (6-6) matched a season high with nine strikeouts over seven innings of three-hit ball and extended his shutout streak to 17 innings. “I just see him going out there and challenging hitters every night with great stuff,” Mets manager Mickey Callaway said. The 28-year-old right-hander has won four consecutive starts for the first time in his career — immediately after going 13 outings without a win, which was the longest stretch by a Mets starter in 20 years. 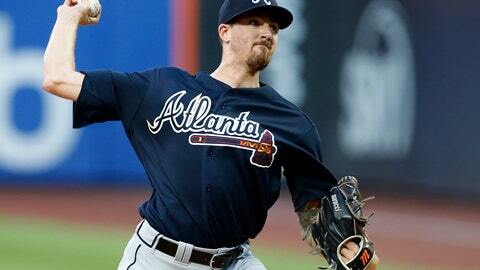 Atlanta obtained Gausman (5-9) from the Orioles on Tuesday to bolster its rotation for a tight NL East race. The right-hander, drafted fourth overall in 2012, was charged with three runs and six hits over five-plus innings during his first professional start for any organization besides Baltimore. Rookie second baseman Jeff McNeil went 4 for 4 and Austin Jackson had an RBI infield single as the Mets halted a four-game skid. They improved to 4-11 against Atlanta this year and won for only the 10th time in their last 34 home games. Bobby Wahl and Robert Gsellman finished the five-hitter, with Gsellman getting four fast outs (all on grounders to McNeil) for his sixth save. Wheeler’s long-awaited emergence after missing the 2015-16 seasons recovering from Tommy John surgery was one reason the struggling Mets held onto him at the non-waiver deadline. They hope he’ll be a big part of a major turnaround next season, and Wheeler was certainly on his game Saturday. Firing 98-99 mph heat, Wheeler fanned his first three batters for the first time in the majors. He has permitted one first-inning run in his past 12 starts after giving up 10 in his initial nine starts. McNeil’s double set up Amed Rosario’s run-scoring grounder in the second before Gausman gave up three straight singles to start the sixth and was pulled. Jackson drove in a run with a single off the foot of reliever Shane Carle, and Kevin Plawecki added a shallow sacrifice fly. After taking early infield work before batting practice, the Mets (45-63) put together a rare game of first-rate defense to delight a crowd of 36,946 that showed up eager to receive Noah Syndergaard as Thor bobbleheads. New York had been outscored 27-5 in going 0-5 against the Braves at Citi Field this season. “I was pretty busy at second base. I’ve been working hard on my defense, so it felt good to make some good plays out there,” McNeil said. Atlanta plans to start left-handers Max Fried and Sean Newcomb in Tuesday’s doubleheader at Washington. Fried tossed a scoreless eighth, wriggling out of a first-and-third jam. Newcomb (10-5) will be on eight days’ rest after throwing 134 pitches last Sunday, when he fell one out short of a no-hitter against the Dodgers. … Matt Harvey is not scheduled to pitch against his former Mets teammates when Cincinnati visits Citi Field for a three-game series beginning Monday. Harvey started the nightcap of Saturday’s doubleheader in Washington and got hit hard. Braves RHP Julio Teheran (8-7) starts the finale of the four-game series Sunday afternoon. Teheran is 9-6 with a 2.33 ERA in his career versus the Mets and has allowed only two runs on 11 hits in 21 innings (0.86 ERA) against them this season. Rookie RHP Corey Oswalt (1-2) pitches for New York in place of injured Steven Matz. Oswalt beat San Diego in his last big league start July 25 for his first career win.